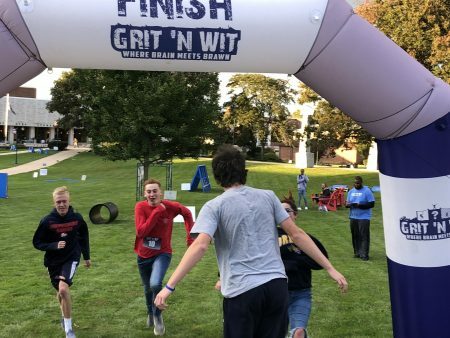 In the third annual Grit ‘N Wit Challenge at Shippensburg the defending champs were edged at the last minute by a formidable group of newcomers. In the first ever Nickelodeon themed Grit ‘N Wit Challenge a bunch of Wild and Crazy Kids showed up to take on the course. After we Double-Dared them to take on the course, the competitors showed a lot of Guts while they Figured it out. We had some familiar faces in the first few heats and a few great times; however, it was some new additions and late-comers that ended up taking down the crown with a flawless run! Thanks to all of our volunteers and for everyone that turned out on a blustery afternoon to kick off a great spirit week at Shippensburg!